As the road to the White House moves through springtime, frustrations with the Republican-Democrat duopoly are growing among voters who would have an affinity with the principles of the Constitution Party of Georgia (CP-Ga). Not just because one’s favorite candidate has dropped out of the race, but also because hard questions are being asked about whether the duopoly actually represents what they tell the voters. Devoted partisan activists are faced with their political party’s rejection of values they hold dear. Average folks are seeing the details of the duopoly’s nomination process and are unnerved at the implications. This is the time for a clarion call to our fellow Americans to join the Constitution Party and build a separate, unique, and distinct political party from the grassroots up! Unlike reform groups like the Democratic Pro-Life Caucus, the various TEA Party groups, or the Republican Assembly, the CP-Ga works to help build a multifaceted network of like-minded supporters and organizations to achieve specific political ends. The past three decades are filled with honest efforts of like-minded patriots who have attempted to change their party from within, either as elected officials or party officials. Most party reform movements are focused only on changing stated policy or personnel of the two major parties. But lasting political change must include building a political infrastructure and culture that promotes the basic principles of Christian civil government. That change is best promoted through a distinct political party with a multi-generational vision to build. True spiritual revival in our communities provides the soil in which the CP-Ga can thrive. The party’s expansion will be paced with the growth of a constituency that will vote for representatives who have the courage to implement these principles of Christian civil government. This will not only ensure that efforts are focused toward credible, competitive campaigns but it helps the CP-Ga resist the political temptation to expand our voter base by compromising our principles. Currently all of the party’s elected officials around the country are serving in local offices. All the CP-Ga's campaigns where ballot access and incumbent recalls are achievable efforts include local party building and political action. With our 2016 Presidential campaign we are concentrating on winning hearts and minds, building our base of support, and preparing to win small battles over the next four years in our communities! In this month’s Update we highlight a story of Christian courage in the face of evil, lest we forget that we overcome when we stand true to the faith no matter the cost. There’s news on our ballot access effort here in Georgia and how we will achieve victory, as well as national party news – including our presidential candidate. We also highlight upcoming events including the Constitution Party of Georgia’s State Convention on Saturday, June 4th in McDonough. P.S. May 5 is the National Day of Prayer. We encourage all supporters to participate at an event near you. Party Wins Ballot Access Victory! In the tiny town of Flssenburg, Germany, close to the Czech border, the remains of a Nazi concentration camp used to torture, interrogate, and execute those who resisted the rule of Hitler serve as a reminder of the cost of resisting dictatorship. A plaque signifies that on April 9, 1945, several prisoners were hanged for their resistance. One of those prisoners had been arrested two years earlier and his family had not from him in weeks. So it came as a surprise to Dietrich Bonhoeffer’s parents when they happened to hear his funeral broadcast from Holy Trinity Church in London on the BBC in July of 1945.
Who was ? What lessons might we learn from his life? Could any of those lessons help us in the day in which we live, here in the United States? By 14 years of age, Dietrich Bonhoeffer had dedicated himself to the study of theology. His father Karl, the most respected psychiatrist in all of Germany, raised Dietrich to be serious about study and to embrace the discipline necessary to become productive in the research and expression of ideas. His mother, Paula, a devout believer and professed Christian, raised him to love Jesus. When Dietrich turned 15, he was given his older brother Walter’s Bible after he was killed in World War I. Also at age 15, in 1921, Dietrich met Bramwell Booth, son of the founder of the Salvation Army, and it impacted him greatly. Karl and Paula raised Dietrich and his seven brothers and sisters to avoid the extremes of nationalism (my country right or wrong) and monarchy (our leader right or wrong). They clearly taught him to be loyal to Christ and the Bible, regardless of the cost. By the time Dietrich turned 17, the effects of the vengeance toward Germany enacted by the Treaty of Versailles that brought about the cease-fire (armistice) of World War I had become a reality, and 1 US dollar was worth 4 billion marks! While others may have embraced the bitterness this harsh atmosphere fostered, Dietrich, because of his study of theology and his doctorate work (1927), was self-controlled. Bonhoeffer soon had to wrestle with the way the Jews were viewed by his nation. Taking some of Luther’s statements (toward the end of his life) about the Jews being the “enemy of Christ,” the regime poisoned the German church with a hatred of God's chosen people. Nazism and the deceptive “Christianity” of Hitler also capitalized on this for political purposes. Soon Bonhoeffer began to expose these liberal tendencies within the church. He was shocked to find on his visit to America in 1930-31 that the US was going in the same direction. He said, “they preach about virtually everything” except the “gospel of Jesus Christ, the cross, sin and forgiveness.” Instead of preaching the Word, “events, teas, lectures, concerts, charity events, opportunities for sports, games, bowling, dancing for every age group” had taken center stage. This slide in the US within the mainline church was a tremendous influence in causing Bonhoeffer to resist that trend in Germany. By 1933, after returning to his homeland, he saw the results of such carnality in Germany: the Fuhrer Principle - viewing one’s leader as a Savior. Germany voted in Hitler but voted out voting, embracing tyranny. They now experienced restrictions on free expression, the press, assembly and postal mail and were subject to house searches without warrants and the confiscation of property. “Positive Christianity” was defined as being totally loyal to the German Fuhrer. The New Nazi religion began to revise the Bible, taking out positive references to Jews. Mein Kempf, Hitler’s writings, replaced the Bible on the altar. Crosses, crucifixes and pictures of saints were all removed. Bonhoeffer began articulating biblical steps for resisting tyranny - speaking, giving aid to victims of persecution, boycotting products, and lawful resistance through the lower magistrate. It is important to note that his resistance of Hitler’s reign was down through associates within the German government. In other words, his resistance was lawful from biblical and constitutional principles. 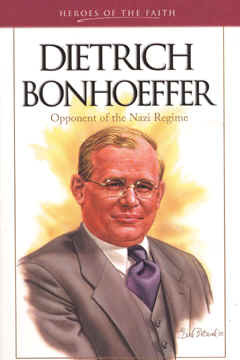 Bonhoeffer, however, would find much resistance from within the German church, and he soon realized that the path he had chosen would bring some dangerous consequences. Though Dietrich met Maria, and began courting her seriously in 1942 when he was 36 and she only 18, they never got to marry. Though his father Karl was honored by Hitler on his 75th birthday, it was the last family gathering they would ever have with Dietrich. Once arrested, he wrote prayers for prisoners, preached sermons to them, and noted that the road to victory included discipline, action, suffering and death. Oh that we might be that committed to Christ and realize that resistance to tyranny is necessary if those who follow us (our children and grandchildren) are to live in freedom! And when the presidential campaign season gets into full swing, it’s almost impossible NOT to get blown over by all the hype, bravado and bluster that is part and parcel of this particular part of the political cycle. And I think you might agree that this seems to be especially true this time around in that the current campaign has included (without mentioning names) threats of criminal indictment, demeaning personal attacks which seem every day to reach a new low, insulting references to some candidates spouses, and blatant, unvarnished support of wealth redistribution policies. Witnessing all of this can leave one feeling a little helpless and desperate when contemplating the future of the republic. Sometimes it seems like things are spiraling hopelessly out of control. Worse still, it seems like there is nothing that the average person can do about it. Do not despair. I believe that there is definitely something that you can do about it. I believe that the answer to the great frustration that we feel is to refocus our priorities to more local matters over which it is eminently possible to have some measure of input and control. First, learn everything you can about your local government. This might take a little time and it will mean shifting the focus of your political vision from the national to the local scene. Regrettably, most people know a great deal of (useless?) information about Obama or Pelosi or Reed or Ryan, and yet couldn’t even tell you the name of their County Councilman or even County Executive. Essentially, this needs to be reversed. I’m not saying that you should never read any national headlines, but I am suggesting that you direct your focus, attention and your available resources on learning the local lay of the land. For example, you should know your local elected officials names, backgrounds, beliefs, and values. You should be familiar with their career histories and their voting records. Moreover, you should have a working knowledge of the structure of your local government. For example, you should learn the schedules of all relevant board and commission meetings. And you should attend the ones that are of interest to you. In this information age, there is a remarkable amount of publicly available information including meetings, agendas, budgets, revenues, expenditures, contracts, projects, rezoning efforts, constitutions and charters. One place you can get started is through the website I publish (PeroutkaTownHall.com), where you will find links to our County Charter, the county code, pending legislation that is currently being considered by the Council, and voting records for all previous legislation. On this site you will also find my analysis of many of the important pieces of legislation this term. As you gain local knowledge, you might be inspired to get involved in a number of ways. Perhaps you will start your own blog and begin to share what you are learning with others. You might consider brushing up on your knowledge of the US and the Maryland Constitutions. In addition to my Council duties I still teach (as a volunteer) about the Constitution and American and Maryland history for the Institute on the Constitution (www.TheAmericanView.com). There are also other national groups such as Hillsdale College that also offer such courses and information online. So rather than let the national coverage of a national campaign over which you have no input or control drive you crazy, consider making a better choice which may just make a difference. Don’t go crazy – go local. You’ll feel better. In 2012 after experiencing ballot access problems, the Green Party of Georgia invited the Constitution Party of Georgia to participate in a federal lawsuit against Secretary of State Brian Kemp to allow their presidential candidates to be placed on the Georgia ballot. CP-Ga members donated their own money to help fund the suit and the Plaintiffs eventually obtained pro-bono representation from Laughlin McDonald of the American Civil Liberties Union. Judge Richard Story initially ruled against the Plaintiffs but had his opinion overturned by the 11th Circuit Court of Appeals. On March 17, 2016 Judge Story struck down the Georgia presidential ballot access law that requires extensive petition signature collection for third parties to place the name of their presidential candidate on a ballot. His new interim ruling enjoins Secretary Kemp from enforcing current law that would have normally required over 52,000 verified signatures for either party to place a candidate on the ballot. The new ruling reduced the requirement to 7,500 signatures, or about 0.15% of registered voters, a dramatic 85% reduction. Judge Story wrote that he was confident that percentage was all that is needed for the state to achieve its compelling interest of avoiding ballot overcrowding and ballot confusion. Garland Favorito picked up the first batch of ballot access petitions from the Secretary of State - Elections Division. But to achieve ballot access we need everyone to pitch in so we can begin immediately. Georgia voters can sign up today to fill out a ballot access petition or help circulate a petition. All CP-Ga supporters can donate today to support the ballot access drive. On April 16 the delegates to the Constitution Party National Convention chose Darrell Castle of Tennessee as its 2016 Presidential Candidate on the first ballot, then chose Scott Bradley as its Vice-Presidential candidate. In addition the delegates from around the nation updated the National Party Platform. In a recent interview Remso Martinez of Liberty Conservatives remarked, "Castle is more liberty-minded than most of the Libertarian Party candidates, and more conservative by miles than Donald Trump. Castle is the only candidate running who takes his talking points from the Founders and his directions from the Constitution. In terms of record, philosophy, stances, and character, Darrell Castle is probably the best individual running for president in this race." Learn more and sign up to support at the Castle 2016 web site today! The idea behind political capital is to “give honor to whom honor is due” by recognizing the many efforts that go into building strong local political organizations. Folks interested in the party start by signing up which earns 10 points. If you donate or become a member of the party you get 10 additional points. By signing up to volunteer you get additional political capital. The CP-Ga recognizes your online and your offline contributions to advance the party and your progress is tracked on your Political Capital page. Word of mouth is the best advertising, so the CP-Ga places a premium on folks who tell their friends and family about the party. Some examples: If you sign the Ballot Access Signup and share the news with your Facebook friends or Twitter followers and they sign, then you get political capital for your signup and every one of your friends who responds to your post or tweet and signs up! Likewise if you circulate a paper petition then you get credit for each of the signatures you gather once the names are entered. Use the Spread the Word page to share the principles of the party via social media. The Volunteer Hub has more online activism ideas! The Leaderboard shows the top go-getters for the current month. The supporter that gets the most political capital for the month of May will get Gary DeMar’s book Myths, Lies, and Half-Truths: How Misreading the Bible Neutralizes Christians and Empowers Liberals, Secularists, and Atheists to help equip you to take a stand for liberty! Note: one prize per individual every twelve months. The success of a new political party is rooted in its ability to attract new supporters and members. Unlike the Democrat/Republican duopoly, there is no existing marketing infrastructure to continually attract voters to join CP-Ga party efforts. Creating a supporter pipeline is the part of the foundation necessary for a separate, unique, and distinct political party. So we start with a small organized and sustained effort to attract and follow up with likely supporters. Without this pipeline we cannot build the base from which to recruit future members, volunteers, donors, or candidates. To build this supporter pipeline we need party member volunteers with the following skills: marketing, media design, constituent service communications, and fundraising. The marketing volunteer creates the messaging to meet the party’s objectives, and manages the communications effort and reporting results. The media design volunteers help with creating graphics, audio, and video to use as part of the messaging. The constituent services volunteers are responsible for timely follow up with all incoming communication via phone, email, social media, and postal mail. And the fundraisers help raise the funds to pay for the communications effort. The supporter pipeline we built is currently on hold due to funding. To keep the supporter pipeline operating we need monthly donations for this project. Can I count on your donation today? Click here to donate. Donors will receive a limited-edition 1 oz. pure copper coin (99.9%) minted to commemorate the Constitution Party. We only have 20 available, so the first 20 donors will receive this stunning coin in appreciation of your support. Can you spare an hour a week to follow up with folks interested in the party and help get them answers to their questions? Constituent services volunteers require a computer with Internet access so they can follow up with contacts in the party’s system and update the contact’s record as appropriate. If you can help then we can put you on the schedule. Click here to volunteer. Maybe you are great with graphics and video, or a great wordsmith who can write a punchy intro for a Facebook post to share on the party’s page. If that fits you and you can help a couple of times a week then click here to volunteer today and then email socialmedia@gaconstitutionparty.org examples or links to your work! The 2016 State Convention will be held on Saturday, June 4th at the Hampton Inn in McDonough. Speakers include Presidential candidate Darrell Castle and other activist leaders from around the state. There will also be training on ballot petitioning and an update on our ballot access efforts. RSVP today! The Constitution Party of Cherokee County meets on the 4th Tuesday of the month. The May 24th meeting will be held in Holly Springs at 6:30 p.m. If you live in Cobb, Bartow, Paulding, Pickens, or north Fulton counties then please join us - RSVP today! More information on events around the state can be found at the Events web page. P.S. Your support helps fund our ability to communicate via this newsletter, promotional materials, etc. Please donate or become a member today! Thank you in advance for your help.